I’ll tell you what is going on. First of all Justin Verlander had ‘core muscle surgery’ and will be down’n’out until the end of February or something. ‘Core muscle surgery’ is not a thing and the above image is the only thing I was able to see whenever I heard it. I’m only a little sorry because it is really the fault of everyone who decided to report this as a ‘core muscle injury’ instead of a real injury to a specific body part. 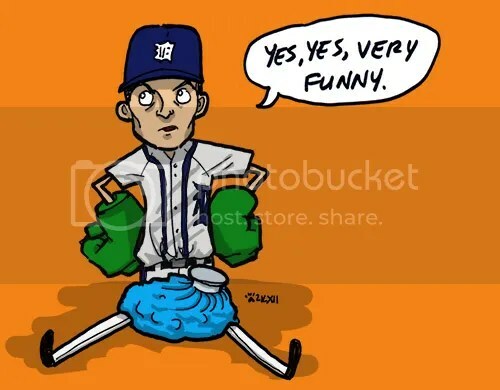 In actuality Verlander probably had a sports hernia, and we all know there are few things in this world worse than herniating your sport. But it was not his arm, and he won’t miss too much of Spring Training, so cross your paws and hope that all’s well that ends surgically repaired. As for what is going on with Roar of the Tigers– well, you have probably noticed how quiet it has been ’round these parts. To that I can only say: uh, I’m in my last year of grad school. And now I am in my last semester of grad school. This is both amazing and terrible; more to the point, it is a lot of work, and especially a lot of drawing, which leaves me little time for non-thesis-related drawing. Ugh! I know. The worst. My thesis show will be in May and if you’re in the Boston area you should totally come because it will involve a lot of DRAWING and also a lot of BASEBALL and some of that will involve the DETROIT TIGERS and also it will be ART and it will mean that I GET A GRADUATE DEGREE. Imagine a world where one can receive a graduate degree for generating hundreds, or possibly thousands of weird baseball drawings. I am living in that world. I invite you to live in it with me. At least come May. So that is the story, and I will try to be better about giving you things to look at here– who knows, maybe some tids and bits that end up not being used for thesis? or somesuch?? But if things are slow and quiet and calm on the RotT front, well, now you know why. Bear me with me, please. Luv u catz! The most unwelcome return of the tigerfly. 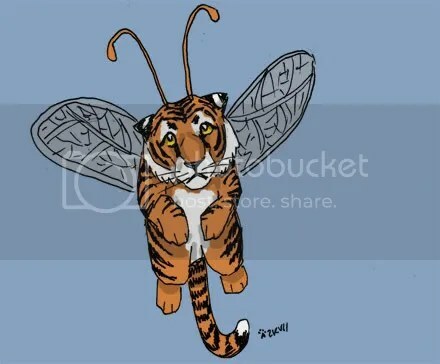 It’s been quite some time since we last saw the tigerfly. That’s fine, that’s good, that is as it should be, because, as we all know, the tigerfly only emerges when the Tigers are dropping like flies. Look at his sad little face. That’s just terrible. Miguel Cabrera: sore/previously injured ankle. Alex Avila: out with ‘mild concussion symptoms’ after running into Prince Fielder with his face. Quintin Berry: some variety of injured shoulder due to excessively enthusiastic outfield diving. 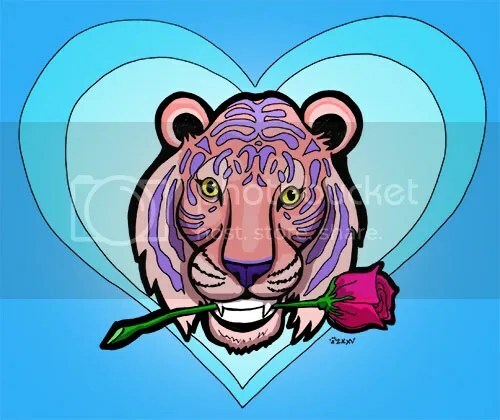 Max Scherzer: sore/’fatigued’ throwing shoulder, holy cats, holy cats, great and almighty Paws nooooooo (and I say this knowing full well that yesterday’s MRI revealed no structural damage). Who else? I’m sure there are other tigerfly casualties out there that I just can’t think of right now because I’m so freaked out by the sight of Scherzer leaving the game early last night and the continued absence of Our Beardy Savior. You can’t even be mad! 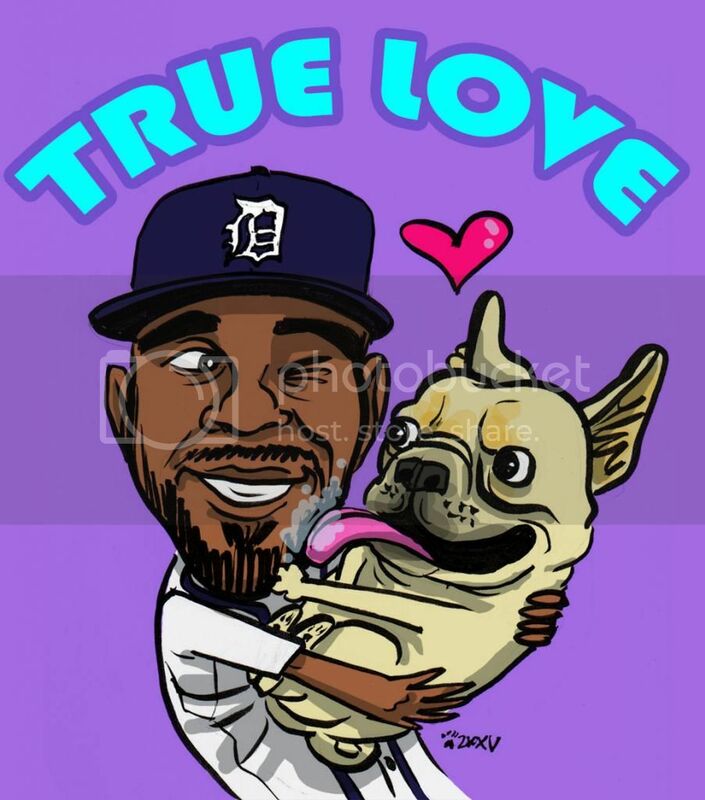 Avila was injured because Prince Fielder is a sturdy little mountain of a man-cat, and you cannot fault Prince Fielder for that, it is his very nature. Do you curse the couch when you break your toe against it? Well, yes, a little, and even more so if the couch has the theoretical ability to watch where it’s going and to decide which foul balls it will pursue and which it will leave to its catcher, but whatever, shut up. “I could feel my arm losing strength. I could feel I didn’t have the strength that I normally have.” That’s a quote from Max, after the game. If that doesn’t make you scream hysterically inside your own head, I’m sorry, but I do not understand you, friend. 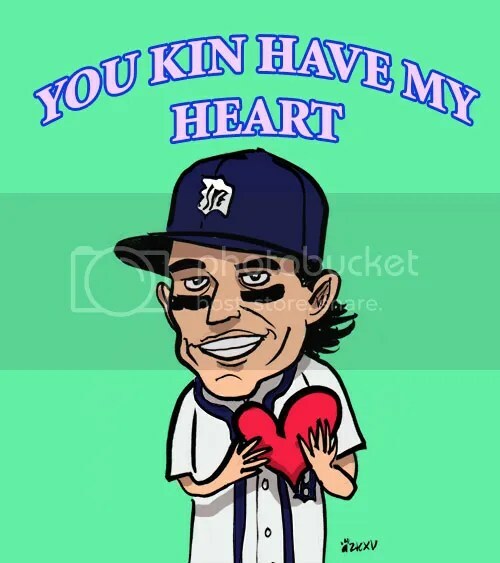 It was already going to be difficult to make the playoffs, thanks in part to things the Tigers have done to themselves, and thanks in part to the continued (very rude) insistence on winning games on the part of the Wrong Sox. Those were already fairly substantial obstacles to overcome. It becomes significantly more difficult with the tigerfly sniping various key players from on high. Great. Splendid. Things of late, as Terrible Cartoons, of course. I’m just going to lead with that one because it makes me happy in my optic nerves. 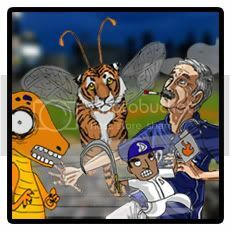 Everyone in the wide world of Tigers fans has his or her own opinion about the team. There is naturally a great deal of disagreement. 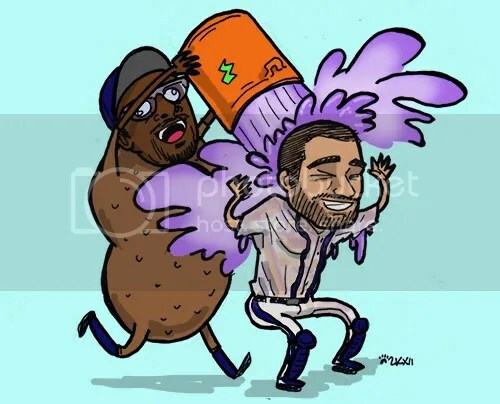 But there is one thing upon which we can all agree, one thing that may be safely and universally acknowledged as an unequivocally beautiful sight: Alex Avila, pleased with his own walk-off hit, being doused in purple Gatorade by an almost unhealthily giddy Papa Grande. It is a fine thing, a fine thing indeed. Especially when Avila’s jersey then gets all wet and it’s all sticking to his torso and it’s a home jersey so it’s white and bits get translucent when soaked, and you get all mad at FSD for not getting longer and more torso-inclusive shots post-soaking, and now I’ve said too much. Thank you, Papa Grande. This keeps on happening, and I suppose it too is a fine thing. Every silver lining, of course, has its cloud, and Scherzer’s high K-counts are still tagging along with the logically attendant high pitch counts, but for now we will accept it. Doug Fister injured his groin. The jokes came thick and fast and inevitably. Everyone is just real sorry about that, Mister Fister, but what do you expect from us? We are baseball fans. We are all ten years old. During the Boston series, Miguel Cabrera fouled a ball off his left shin and, as a result, the third baseman has been experiencing some “drainage” in his ankle, head athletic trainer Kevin Rand said on Sunday morning. What in the world does that mean? How can an ankle be experiencing ‘drainage’? That sounds anatomically difficult and worrying. 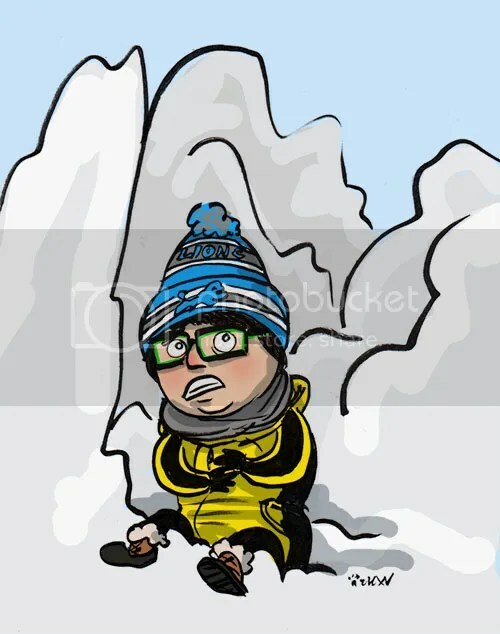 I cannot know, I can only draw. 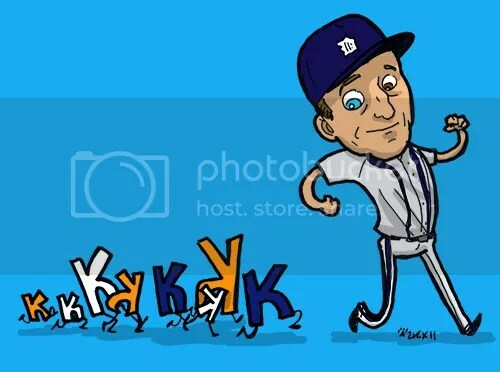 Drew Smyly is back! He got a spot start and should be sticking around in the bullpen even when he gets bumped from the rotation. The persistence of Delmon Young’s mustache should be a source of concern for us all. But he has also been on a bit of a hitting tear lately. Does this… does this mean that the mustache is actually doing the hitting for him?? I think this is a possibility that we need to deeply consider. It would explain how that upper lip décor has hung around this long, despite (what must surely be) the strong recommendations of everyone who knows Delmon personally and also has eyes. Just throwing this one in for good luck. 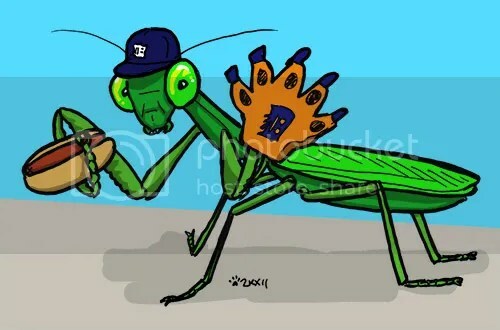 The mantises have been back in attendance, all over MLB, and yes, they have been spotted– and occasionally photographed— in Detroit. Praise be! Miguel Cabrera and Prince Fielder sure can hit some baseballs. They can hit a baseball a long distance. 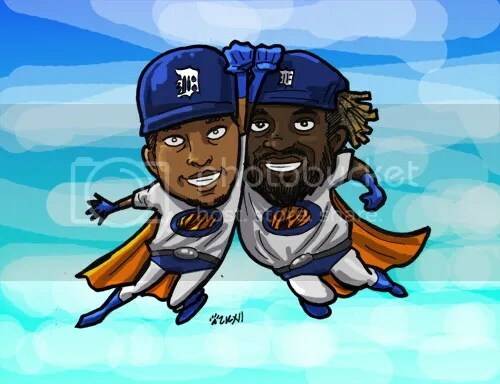 Now, it’s only been three games, but in those three games as a 3-4 combo Miggy and Prince have been everything we’ve dreamed thus far. They are best lineup buddies. They are super in both the superlative and hero senses. They are magical and lovely and by their powers combined even greater heights of magical loveliness will be attained. 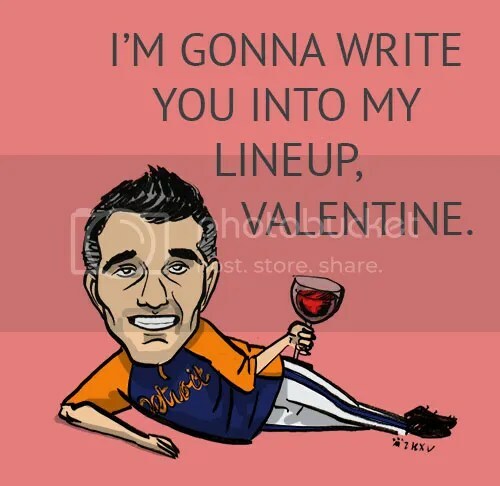 Justin Verlander. Everything about Justin Verlander. Doug Fister is on the DL. (Insert ten minutes of hysterical screaming here.) 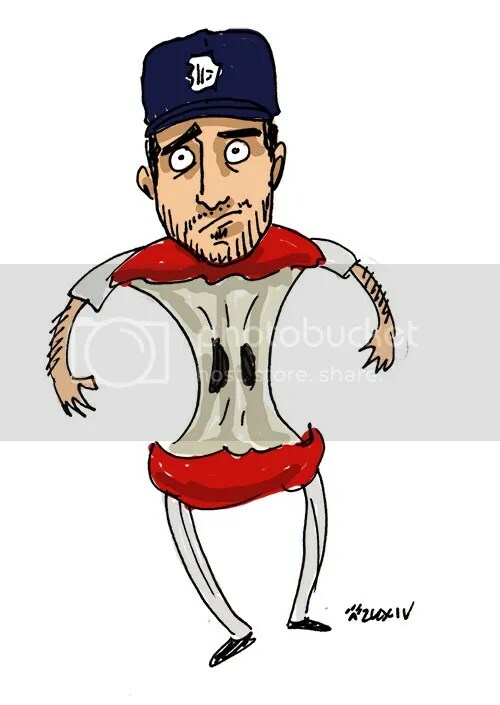 He has a ‘left costochondral strain’, which means that he over-stretched/strained the cartilage connecting his ribs to his sternum. It’s not an oblique injury, or at least that’s what they’re telling us right now, because they know how that one little word will send us all into death spirals of panic. Ha ha! Shows what you know, team! I’ll go into a death spiral of panic ANYWAYS! 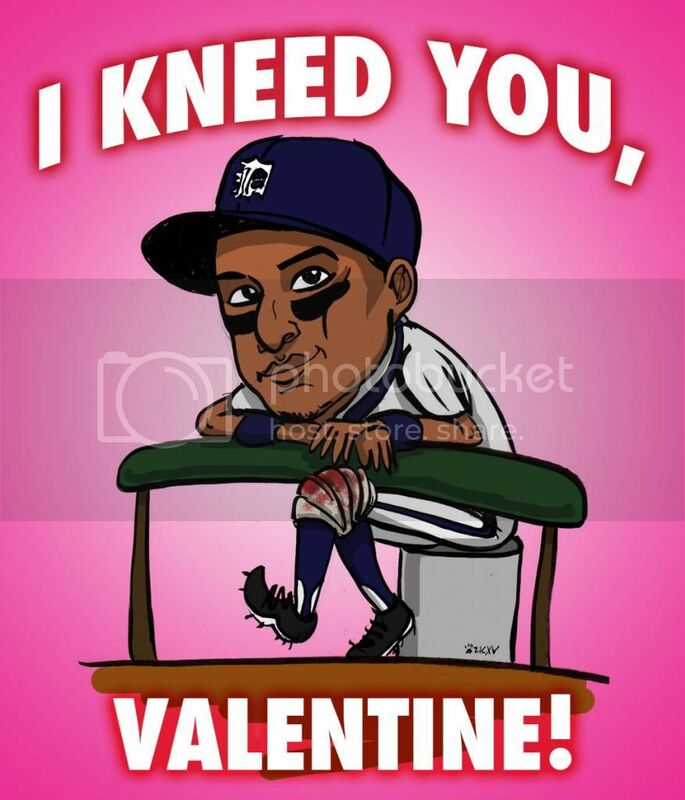 You can’t stop my Tigers-related neuroses!! 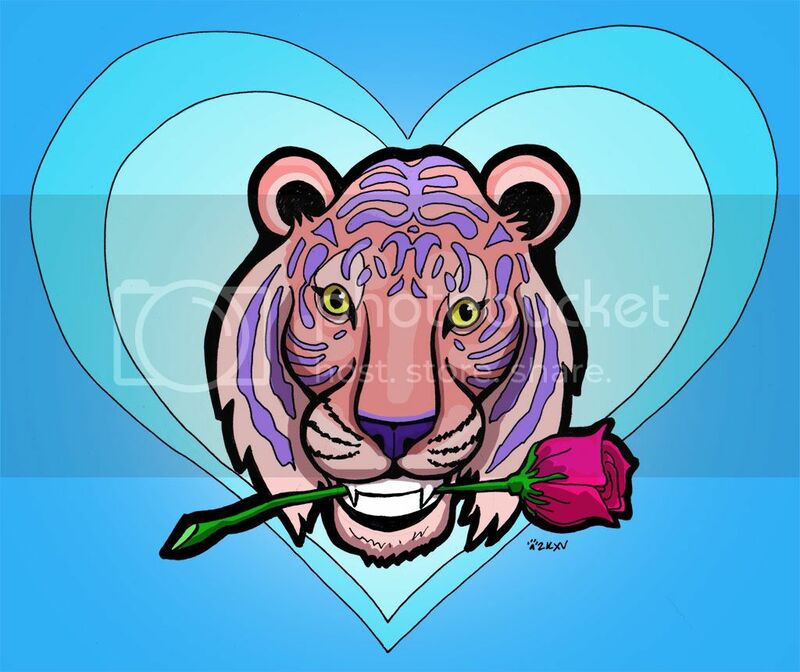 The only thing Fister can do about this particular injury is rest. This is both a good thing (noninvasive and uncomplicated healing procedure) and a bad thing (no quick and solid fix, no real way to prevent it from happening again). We’re not yet sure who will replace him in the rotation, because I guess it builds character to make us panic a little longer. Good thing we had that prolonged competition for the 5th starter spot, though, right? That means we have a bunch of cats in the minors right now who are all starter-ready and chomping at the proverbial bit, right? Right?? Alex Avila is fresh and not yet so exhausted that he can barely heft a bat. It is nice to see, and the results of such freshness are also nice to see. Beardy and nice. Walkoff nice. Max Scherzer on Sunday. Seven runs in 2.2 innings, with no injury excuses (so far as we know). Even under normal circumstances this would be somewhat worrying; having just lost Mister Fister, it is THOROUGHLY worrying. Consider me duly worried. The fact that even with two starters leaving games early, the bullpen was effective and helped keep both games from getting out of paw. This is like the exact opposite of what happened with the Red Sox, and is in fact rather heartening if you can ignore the reasons why we had to see so much of the ‘pen in this series. 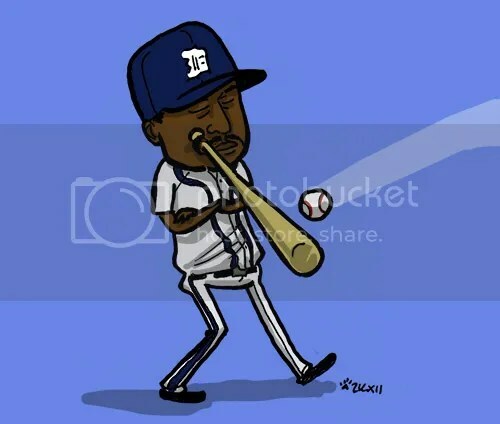 Jose Valverde blowing his first save in a million years or whatever it was. Of course then he went on to officially get the Win, so… I guess that’s something. A terrible something that does little more than point to the foolishness of statistics like Wins, but, you know, maybe it will make him feel better about himself deep within his own heart. Miguel Cabrera making funny, awkward-acrobatic plays at third. Miguel Cabrera making equally funny, but much more inept plays at third. 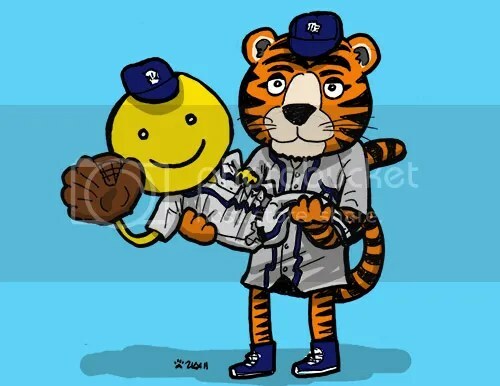 I really personally enjoyed the heck out of what the Tigers did in this series, ridiculous and unreliable as much of it may have been. HOWEVER, as soon as the Tigers buzz wears off, I am going to be freaked out by the (non)performance of the Red Sox. Not as much as many in Boston, who are already crying ULTIMATE DOOM and all that, but a good amount of freaked out. This is a team that is doing its best to announce that it has capital-P-Problems, and if you think Detroit sports radio can get crazy when Detroit teams are starting to lose, let me assure you, it is as nothing compared to Boston sports radio. Because these games were all broadcast on the Red Sox TV network, I have not yet had to see/hear whatever fresh chthonic horror is being visited upon us this season under the guise of April in the D.